When you visit Hurn & Hurn, you will discover a home and design store with a difference. Filled with Boutique chic items to turn every home space into a stylish and comfortable haven, it’s safe to say that the company motto; ‘Discover the Unusual’, perfectly describes its philosophy and what you can expect to find with a browse. This is where to go for a fresh take on your interior décor, and where to go to make those small changes that can make a great difference. Opt for Lighting to find bright inspiration in styles such as modern and industrial, alongside chic and classic options too. Shop by room, trend, category and more - from clocks to bedding and from candles to storage - you’ll find those items that your home is yearning for here. Why not check out the Discover section? Here you can explore the latest design trends and interior favourites which have been hand-picked by a group of loving experts. Be inspired to create a unique and fashionable living space which suits your own personal taste. Hurn & Hurn is perfect to gift yourself and another too. Browse a plentiful section of Gifts & Accessories to find an array of delightful choices, whether you want an eco-friendly product, a Made in Britain special, or something from your favourite brand - you’ll be sure to find it at Hurn & Hurn. How do I use my Hurn and Hurn discount code? If the offer doesn’t require a discount code, your discount will be included automatically. Join the exclusive Hurn & Hurn newsletter to stay in the know about all the latest updates and special offers. When is the Hurn & Hurn sale? For a good deal all year round, you can browse the Offers page, while you wait for any seasonal sales! Does Hurn & Hurn offer student discount? Not currently, however, stay connected with vouchercloud and we’ll let you know if anything were to change. Can I recycle my old electricals with Hurn & Hurn? Yes! Whenever you buy a new Hurn & Hurn electrical item, you can return your old one to be recycled completely free. FREE UK delivery on orders over £50, find more information online. 30-day returns policy, call 01603 559250/email sales@hurnandhurn.com in the event that you should want to request a refund. Email: sales@hurnandhurn.com or fill in the online form. Hurn and Hurn stocks a unique collection of homeware, home accessories and gifts to suit every abode and occasion. Apply a Hurn and Hurn discount code when you’re at the checkout and make a house a home for less. Choose from a selection of hand-picked, original, high quality collections from up and coming designers as well as a range of celebrated names in the world of home décor. For all of your stylish home updates, Hurn & Hurn is there to help. Plus, if you want a little inspiration from the experts, you can browse the blog to check out the latest features on how to get the most out of your home décor. From new collection reviews to seasonal style tips and tricks - this is where you can get to know the brands behind the beautiful goods on offer and where you can get creative with your home and your lifestyle too. 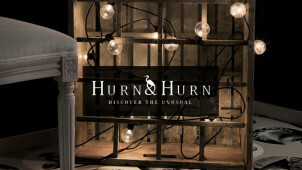 If you’re looking for something modern, stylish and quirky to complete the room, but don’t quite know what you’re looking for, then why not check out the diverse range of lighting products at Hurn and Hurn. Whilst you’re feeling adventurous, why not browse for a Hurn and Hurn voucher code? From desk lamps to light boxes, there’s something to make every room shine for less!